Besides the well-known tocopherols and tocotrienols, minor derivatives of 6-hydroxy-chromanols and 6-hydroxy-chromenols received intensified attention in recent years. The meroditerpenoids presented here were found in terrestrial and marine organisms and exhibited distinct structural and biochemical properties. Almost 80 sesquiterpenes with side chain modifications are described. Compounds with anti-inflammatory and cytotoxic properties have a high potential as drug lead structures. Schubert M, Kluge S, Schmölz L, Wallert M, Galli F, Birringer M, Lorkowski S. Long-chain metabolites of vitamin E. Antioxidants (Basel, Switzerland). 2018;7 https://doi.org/10.3390/antiox7010010. 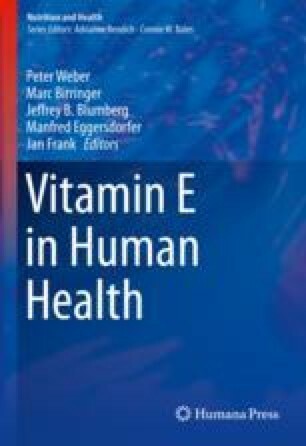 Schmölz L, Wallert M, Rozzino N, Cignarella A, Galli F, Glei M, Werz O, Koeberle A, Birringer M, Lorkowski S. Structure-function relationship studies in vitro reveal distinct and specific effects of long-chain metabolites of vitamin E. Mol Nutr Food Res. 2017; https://doi.org/10.1002/mnfr.201700562.